I couldn’t avoid making a certain comparisson after seeing the photo on the left, almost a movie still extracted from the film Charlie Wilson’s War, directed by Mike Nichols. Oscar winner actors Tom Hanks and Julia Roberts play powerful political figures, and powerful they are in Hollywood as well. 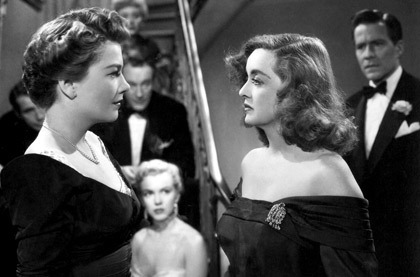 On the right, there’s Bette Davis and Anne Baxter in the classic All About Eve, both nominated for an academy award for playing the diva and the actress wanna-be, respectively. Only in one film the characters are rivals, what’s the similarity, then? Their out of focus starlets, of course. In the 1950 film, it was Marilyn Monroe, in one of her first supporting roles, just an insignificant beauty that soon would outshine not only the powerful lead actress, as well as everyone else in Hollywood. Could it be the case of our favourite new red-haired girl in a couple of years?